...to the Chapter House at Wells cathedral. Probably better on large view if you have a moment. Taken during our away-week in October, not as shown. 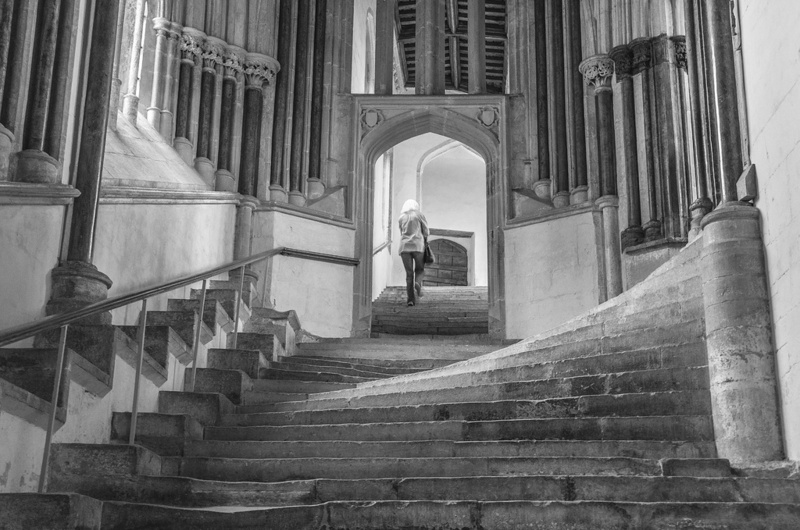 Not long after I realised how much I enjoy structure, shape, architecure and such, I recalled this amazing flight of steps but I could never bring to mind where I'd seen it , so when I came across it in the cathedral at Wells, I was very happy indeed. The steps on the right that seem to grow out of the others maybe don't make a lot of sense ; they lead to yet another area in the cathedral but I didn't manage to get a good angle to show the door. It's what's stopped me posting this until now but I love this view to bits and recently had a re-think and decided to put this photo into the album and b****r the door. It wasn't part of my memory anyway. This is a great shot Alison. Especially in b/w. Absolutely fantastic, I'm glad you decided to post it. Fav, big one! Alison, this is a great pov. I particularly like the shades of light and dark and those amazing steps! Fav! Wow. That's almost Escher. Fab! Excellent shot, great subject and composition. Works well in b/w. Fav. Super pov - works so well in mono, Alison. The light makes the steps seem to flow in waves. Has a mesmerizing quality, leading you in then flowing back out. Fav. It's a fantastic shot, with great lines, textures, and perfect processing. Escher is the first thing I thought of too, just beautiful. Love that there's a person in the photo. This is amazing! Fantastic capture and always. You do have such an eye for architecture, balance, and symmetry. I could go on and on.... Fav! Wonderful capture and composition. Love the B&W tones. This is absolutely stunning. Fav. Just seen this image on the trending page, wonderful shot. Wonderful in b & w, love all the symmetry, fav. Wonderful perspective,super B/W shot!! FAV!! Super fabulous POV and tones. Beautifully done, Alison. Lovely shot of an amazing piece of construction, but a bit scary for anyone with a walking difficulty. Love the lines!! The lady walking up the stairs makes this shot so much more interesting!! I don't know how I missed this one - what a really neat composition of lines - The perspective you chose is perfect and including the woman seems to be just right. It doesn't take anything away from those steps and where they lead. Love the shot and see why it stuck with you. A superb shot Alison! A Sea of Steps. Another fav from me! Such an interesting shot. I think the door you were trying to get may have complicated the scene too much anyway??? I like the lead up to the woman as the focus! Brilliant -- congrats on being in the TT this week! A beautiful shot, congrats on TT. Many congrats Alison, one of your best shots and a worthy TT place for it. Congrats on the TT Alison,very well deserved!! Congratulations Alison...so well deserved on TT!! congratulations on the TT, Alison! So well deserved! @taffy @jo13 @seanoneill @carolmw @eyesmile @pflauIme @soboy5 Many thanks to you. It's never occurred to me that I'd get a photo in the TT, what a surprise! @claireuk Aww, thank you, Claire! @rennes Thank you, Lisa, very much appreciated. Gorgeous. Congrats on TT. Well deserved. @willowdragon @libertylady That's kind of you, ladies, thank you. Yes. Beautifully captured. There is definitely the feel of the "decisive moment" in this one. Nice work. I love that view too. They are a great flight of stairs. I have one of that stunning ceiling in the Chapter chamber where the twelve seats are. So here's something crazy. I remember seeing this photo and commenting and fav'ing it. But for some reason neither are on here. Crazy. So fav again. Brilliant capture.